Despite its air of point-and-click friendliness, and Apple's tendency to precede its own applications with the letter 'i', its OS X operating system is actually a lot like Linux. Both OS X and Linux have a similar system at their core, based on an old-school multi-user operating system called UNIX, and many of the tools and utilities that make OS X useful are the same as those you'll find within Linux. 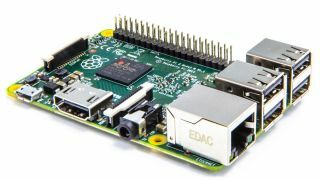 Consequently, this gives you something of an advantage when it comes to using the Raspberry Pi. If you've ever used the command line from OS X, for example, you'll find exactly the same command line, with almost all the same commands, on the Raspberry Pi. OS X bundles tools that you'll also find on a Raspberry Pi. Similar, too, are the concepts of user accounts and home directories, network printing and file sharing, and you'll find that the Raspberry Pi will work almost as well with OS X as it does with Linux. You can easily connect to it from the command line, share a virtual desktop environment and configure your Pi remotely, all without installing a single piece of additional software on your Mac. But before you get to that stage, you will have to first install Raspbian on to your Pi's memory card. From OS X, like Linux, the standard way of installing the Raspbian operating system on to your SD card is from the command line. But there's a safer, easier option, and that's using a graphical tool developed to do exactly the same job. This tool is called the RPi-sd card builder, Download the builder to a local folder, and also make sure you've got hold of the latest Raspbian image, as the card builder tool needs this in the first step. To save you from resorting to the command line so early on, the Rpi-sd card builder will do the same job with just a couple of clicks. Make sure you grab the version labelled 'Debian Wheezy' and not the version labelled 'soft-float'. Clicking on the download link will take you to another page where hopefully the download will automatically start. If it doesn't, try another link listed as 'mirror' from the same page. These mirrors are different servers on the internet that host the same file so that the download burden is shared. The download is usually around 500MB, and should only take a few minutes with a good connection, although the speed is often more limited by the mirror rather than your connection.